Read the latest in our ongoing Unlikely Media series. As part of this series, oDR profiles new independent (and independently-minded) publications from across the post-Soviet space, and we interview editors who are trying to make spaces for alternative journalism, political commentary and reporting. Here, Maxim Edwards talks to Alexander Zamyatin and Marina Runovich, who run Zerkalo. Zerkalo (“Mirror) is a non-commercial platform dedicated to social injustice in Russia, a relevant topic in a country where 22 million people are living below the poverty line, and where the social guarantees older generations grew up with are becoming a privilege. We also translate and publish one of Zerkalo's recent articles — on the residents of Kuznetsk, who are fighting one of the world's largest pipeline operators. How did it occur to you to found the website, and why did you choose the name Zerkalo (“Mirror”)? Alexander: The project’s initial idea seems so straightforward to me that I believe in its success regardless of our limited resources: by any estimates, there’s a very high level of social inequality in Russia — but if you take a peek into Russia’s media landscape, you’d think that the problem simply doesn’t exist. We decided not to bury ourselves in reflections as to why this might be, why nobody has tried to popularise the issue, and preferred to get down to business ourselves. There are no party-affiliated think tanks in Russia, as there are no parties nor funds which are prepared to sponsor anything more than academic research. This meant we had to take a more creative approach — we decided to found our own small media project, focusing on Russia’s social realities. The editorial board was formed more spontaneously than functionally — we simply couldn’t afford to recruit professionals and offer them a steady salary, so instead tried to others to work with, on the basis of their enthusiasm and capability. But such arrangements rarely last long, and the editorial team has already changed. There are now just two of us. The very name “Zerkalo” was the product of a chaotic period of brainstorming, starting with the intention that the project should be perceived as widely as possible by the readers. Everybody should easily be able to interpret the name in their own way. How has your project been received by those whom you write about? Do they find their reflections in the “mirror”? Alexander: I’ll say straight away that we have no intention of gathering some new “dangerous class” from among the downtrodden, and propagandising ideas of equality to them. That would be naive and stupid. Russia has a high level of internet penetration, so we’re able to hold discussions about inequality with people from all walks of life, ideally without resorting to stereotypes about “beggars”. In fact, our goal is to fight stigmatisation. Before we launched, we had several hypotheses about who our audience would turn out to be. After all, the materials on our site link up radically different social groups. We now know that our readers are generally over 45 years old, or to a lesser extent, between 25 and 35. But the hardest thing to figure out is which people featured in our stories will become our readers. Marina: I didn’t participate in the launch of the project, but I arrived with the same question — who’s our target audience? It’s a strange and scary feeling to do this blind, supposing that everyone needs this kind of initiative but not actually knowing who they are. But my own work as an editor and photographer taught me that we should count on progressive young people (as in all media projects with a social focus), as well as people close to middle age who have experienced serious inequality but may not always understand its origins. Many of them hold opinions like “if you’ve fallen on hard times, then that’s your fault. We shouldn’t pity anyone.” And sure, maybe feeling sorry for people isn’t always the way forward, but it’d be great if we could at least try to sort out the problems and help them at the same time. We try and debunk stereotypes by examining everyday examples of our social reality. To my mind, that’s how Zerkalo can speak to a lot of people — our subject is close to them, so it’s no surprise. According to your site, there’s not a single professional journalist among your team. Do you have any regular authors, and who are they? Alexander: Most of our texts are produced by third-party authors who for one reason or another are not able to work with us all the time, but can occasionally provide a good text or photo-essay. We’d like our authors to stay on board, but we of course appreciate that we can’t offer them all the opportunities they’d like. Marina: It’s great when talented people are ready to do something on a well-known platform simply for the sake of an idea. But we’re not so big — at least, not yet. Usually authors approach us to suggest relevant topics; we don’t commission articles. If somebody suggests a topic which is close to them, then usually the resulting article is very strong. For example, the last article we published (“To demolish a house with your own hands” by Vadim Skvortsov) was about residents of Kuznetsk [a town in Penza region] who were to be evicted by a firm building a new pipeline. I really liked it — it was a very personal piece, but also took a broad and objective view of the situation. The frequent authors are, really, just Aleksandr and me. I hope that there’ll be more of us. It’s not quite true that there are no professional journalists in our ranks — I’m trying to work in that direction myself. But sure, you could say we don’t yet have a 100% professional journalist on our team. How is your project financed? Alexander: Zerkalo survives off crowdfunding — although the start-up costs came from our own pockets. They’re miserly amounts; we can’t really do much for the moment. Over the next six month, we plan to expand our project in several new directions, for which we’ll need significant funds. Whether that’ll happen or not is entirely up to our donors. We can only try and convince them that the funds will be effectively spent, on a project which covers an extremely important social issue. Marina: I’m not so enthusiastic about crowdfunding, but grants or other financial assistance like that, for such a controversial topic as ours, are also not an option. We’d no longer be independent. 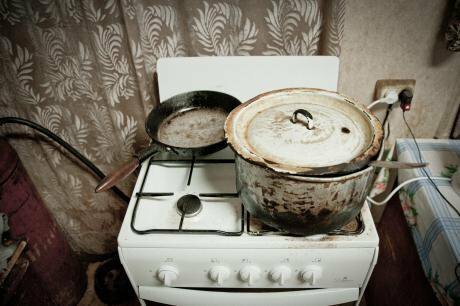 You note that every sixth Russian citizen lives below the poverty line. Last year alone, 41% of Russians admitted that they didn’t have enough money to buy food or clothes. What’s the situation at the start of 2017 — is there any chance it can change for the better? 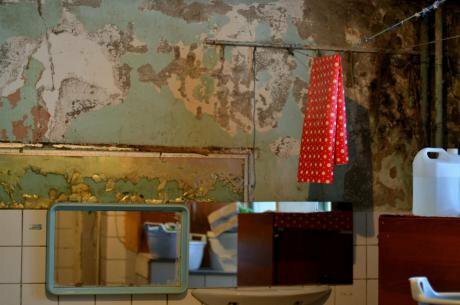 Alexander: Yes, we’ve witnessed an astonishing growth of the number of Russians living below the poverty line — from 16m in 2013 to 19m in 2015. Last year, the number grew to 21.4m. Even accounting for the fact that there may have been technical changes in defining the poverty line, that’s a very significant rise. Today, the median monthly salary in Russia is 25,000 roubles [£350] — that is, every second working Russian receives not more than that sum. Public opinion polls and official statistics regularly demonstrate that there’s been a decline in production, an economic crisis, and a fall in the average paycheque. But at the same time, these are speculative, lending themselves to at least three distinct political convictions and interpretations — the neoliberal, which concerns the limits of an economic model for growth, the state-conservative, which calls for re-industrialisation, and the pro-government, which calls for reforming sluggish sectors of the economy, frantically searching for points of growth in the economy, the better to enter global production chains more effectively. But what’s interesting is that this mishmash of data still has no direct relationship to inequality per se. Firstly, there is no strong correlation between levels of inequality and GDP growth. During the wild economic growth of the 2000s, there was a decrease in the number of Russians living below the poverty line; from 42.3m in 2000 to 17.7m by 2010. But 80 billionaires also appeared over the same period. In Russia in 2000, there hadn’t been a single one! However, throughout that period, Russia’s Gini Coefficient fell below 40 on just one occasion — during the economic crisis in 2009. Secondly, income inequality isn’t the same thing as inequality in accumulated capital. The yachts of Russia’s wealthy, assembled in German shipyards and bought for offshore legal entities, inject funds into foreign countries’ GDPs, while widening the property ownership gap at home, in Russia. To put it very simply, an economic “crisis” is about absolute indicators — social inequality is established with relative indicators. And social inequality is encumbered with its own very unique range of effects, several of which we experience on a day-to-day basis. People’s relative positions on the income scale are as relevant when talking about, say, availability of pharmaceuticals as when discussing who owns which yacht. How do Russian media approach the subject of social inequality? Alexander: With inertia. The subtleties of the topic, like we just discussed, such as the structural origins of inequality and its effects are simply seen as too complex for mass media consumption. And by the indicators mentioned above, Russia finds itself somewhere between Mali and Trinidad & Tobago. This doesn’t surprise me at all. On the contrary, given what I’ve witnessed in my life, such figures can only be understood in the context of social inequality. As such, the topic has the most powerful explanatory potential for the state of our society — but there’s not yet an institution in Russia which has developed and popularised the subject for a wider audience. And in the long term, that’s something we’d like to organise. Marina: Materials similar to the texts we publish appear perhaps once a month, maybe even less frequently, on the major federal media outlets. There are of course popular informal projects, but they often poeticise these stories [of inequality] in Russian daily life, presenting them as a sad burden our country has to bear. In my view, it’s not sufficient to just deal with these topics “from the heart” — there has to be a level-headed, analytical approach. We also plan to regularly invite sociologists and economists to help us produce and publish the texts on our site, giving readers a thorough look at familiar topics through the prism of social inequality. Miners in Rostov recently declared a hunger strike, and construction workers at a cosmodrome in the Amur region downed tools. Over the past year and a half, there’s been a strong growth in protests due to unpaid wages and violations of labour rights. But even Russia’s protesting truckers, in one of the most significant examples of labour unrest, appealed to Putin to solve their problems. Could this lead to the emergence of a nationwide, independent movement for workers’ rights, and what role does labour protest play in today’s political agenda? Alexander: Practically none. It’s something of a pipe dream for Russian leftists — this idea that, due to deteriorating material circumstances, working people will become more politically self-aware and become a political force (and, of course, along correct, wholesome Marxist lines). Yet more often than not, these protests run out of steam at an early stage. The most recent, most memorable example was the farmers’ march on Moscow on their tractors. It ended as quickly as it began, at the borders of the Moscow region, and in the office of the head of Russia’ Investigative Committee. More passive labour protests are not enough on their own — they need to be combined with an active political struggle, with its own structures and leaders able to contest elections and engage with actual public opinion and actual public demands (not just with our conceptions of what they are). They need to be able to intensify demands for freedom of expression and freedom of assembly. But nowadays, only Russia’s right-liberal opposition has been able to play that role, and labour protests are the very last thing to appear on their political agenda. Despite everything I’ve just said, I still look towards our political future with great hope — a hint of progress glimmers in public discourse. Maria: “Workers’ protests” begin, naturally, at the workplace. But while some people take to the streets in protest, others continue their everyday work, spending a good chunk of their free time fighting for rights within their organisation. I addressed this in my own article about the employees of St Petersburg’s Pulkovo observatory, who are fighting against construction work taking place on their institution’s grounds, which are a protected area. In terms of Russia’s current political agenda, labour protest plays quite a small role, but for the purposes of our discussion, the story of the Pulkovo observatory is very revealing. Nobody is hanging protest banners over telescopes, but their success in achieving their goals and defending their workplace is enviable. Under better circumstances, a scholar should be able to concentrate on their research, rather than spend their time buying office furniture and organising campaigns to defend their workplace. That said, their persistence is inspiring, inflaming the spirit of unity between protesters. You’ve used the term “social racism” on the website — what does it mean to you? Alexander: It’s a useful term that can be taken as read — simply, it means intolerance on the basis of wealth inequality. Say that a guy walks down Kamergersky lane [a fashionable street in central Moscow], and suddenly feels ashamed of his dishevelled clothes and worn-out boots. Say he notices catches scornful looks and sneers, and begins embarrassed — by his family, by himself, by his very way of life. That’s an ordinary form of social racism. I must admit that my fight against social inequality isn’t entirely based on rational argument, but also the result of personally experiencing this discrimination at a certain period in my life. Since then, I’ve noticed the terrible power of privilege, everywhere and every day. The dominance of social racism in Russia motivates me, but also drives me to take action in a good way. Marina: For me, social racism isn’t simply when you’re looked down on for what trainers you wear, the model of phone in your pocket, or privileges (or lack thereof) of property at all. It’s also psychological — it even manifests itself in not being able, for example, to allow yourself to appear stupid. It’s when you can’t afford to drop out of higher education, as some people can, because you’ll have even fewer options without a diploma. And then they’ll measure and value you all by IQ anyway. 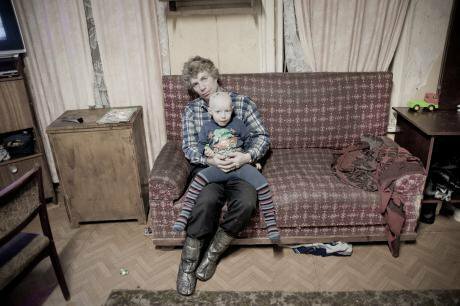 Lev Gudkov recently noted a tendency of Russian citizens towards “passive adaptation”. What are your thoughts — do Russians really live by the principle “there’s no money, but we’ll hang on,” to paraphrase Dmitry Medvedev? Alexander: I wouldn’t want to argue with a sociologist on his home turf, but to deduce some general tendencies in attitude, and then arbitrarily assign them a “national” characteristic is not a method appropriate for sociological study. National “mentalities” don’t exist — after all, remember the example of Nogales in Acemoğlu and Robinson’s famous book. We shouldn’t speak of any innate attitude on the part of Russians to their challenging socioeconomic situation. Clearly, you’re wonder when we’ll get fed up with it all and pick up our pitchforks. But it’s been obvious for a long time now that things don’t work like that. I remember how one resident of a decrepit old communal building in Tver (whose story we covered in our article “The most famous barracks in Russia”) pleaded with us to inform Putin about her sorry living conditions: “He just doesn’t know what’s going on here.” And then she badmouthed the recently-arrested minister of economics, Alexey Ulyukayev. These kind of statements aren’t unusual to hear from the people featured in our articles. So, can this woman’s attitude be described as “passive adaptation”? I think the root of the issue lies elsewhere. For example, everybody understands that children have to attend school, because school is an institution which functions. But elections and local government clearly aren’t — because this woman is helpless in defending her rights. That means we have to ensure these institutions do their job — maybe even run them ourselves — not simply wait until the state permits us to. All institutions in our society which actually work, including the school, do so only with partial involvement from the government. By the way, all broader institutions of social support in Russia are deeply inadequate in this respect. Any progressive political initiative has to be preceded by an infrastructure — a whole array of organisations fighting for economic and political rights, for education, for the free flow of information, for local government and so on. Whether poverty and inequality become pressing issues on the political agenda depends on whether we can make them key issues in public discourse. And we can. Your topic is becoming ever more relevant. What’s planned for the future of Zerkalo? Alexander: Yes, it’s an ongoing tendency, as inequality has always been with us, but we’ve only just started to measure, to get to grips with it. Our task is to move away from this purely empirical, descriptive form of analysis to a more explanatory presentation of social problems, through the prism of inequality. There’s already a massive amount of research on the topic worldwide, which aid NGOs and government institutions in their reforms and development programmes. We import the most interesting findings from international research. We’ll organise lectures, publish translations and bring in experts who can deal with specific cases of inequality and decide on programmes to address them. We need to gather together professionals who are interested in the subject — at the moment, they’re dispersed throughout the country. Whether through government departments, partnership programmes or even by getting involved in the formation of future social institutions, we can work out real and concrete schemes to fight against inequality and poverty in Russia — but for that, we need a structure. Want to know more about Mirror's work? We've translated one of their recent articles. Find it here. 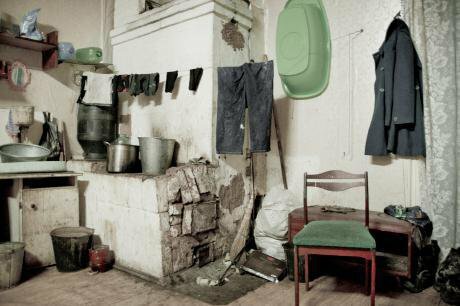 Photographs from a dormitory in Moscow and villages in Ivanovo Oblast by Marina Runovich and Timofei Izotov. All rights reserved.